Emmy began therapy visits after being certified with Therapy Dogs International and she earned her AKC Therapy Dog title in 2013. Emmy has accumulated over 170 visits in 3 areas-reading assistance dog, special education preschool and long term care visits. Emmy began her therapy work attending reading sessions with students where she was able to improve their reading skills. She patiently “listened” while she lay next to a student struggling to read. Emmy was an incentive for the student to try harder as they were excited to be “the student who got to read with a dog”. Emmy loved to play a game of fetch or do some tricks as a reward for the student for a job well done. Five years ago, the special education preschool teacher was so impressed with Emmy’s calm attitude and the student’s enthusiasm, that we were invited to work with her students. Since then, the special ed students look forward to our weekly visit which is known as “Emmy Day.” Emmy has worked with over 50 preschoolers. 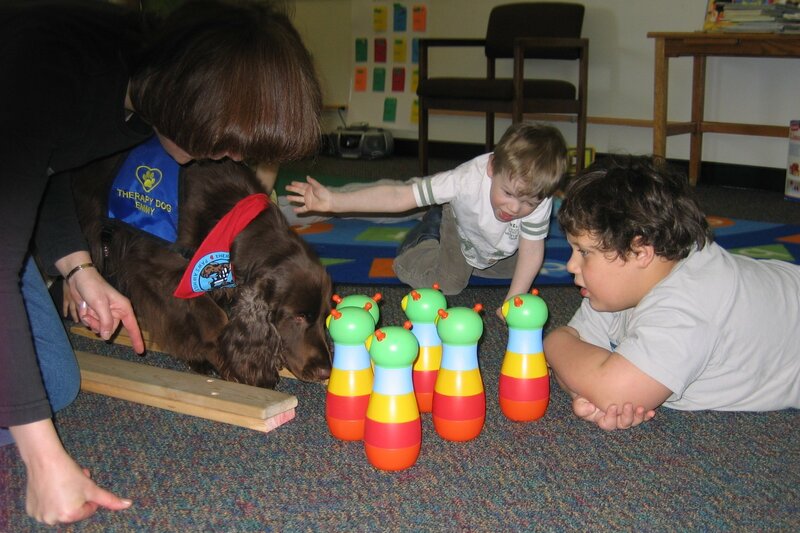 She has helped them learn many skills such as taking turns, counting, the alphabet, colors, shapes, using words to communicate, and concepts such as location (in, out, beside). Some of the games we played to teach these skills included Emmy pushing a bowling ball and the students counting the number of pins she knocked over, putting a treat on a shape for Emmy to jump through a hoop and get, hiding a toy squirrel for Emmy to find and identify the plastic letter hidden in it, giving Emmy the cue to “stay” or “go” through the tunnel, and telling Emmy to get “in” or come “out” of her kennel. Emmy also spent some one on one time with a developmentally disabled boy who participated in doing laps during gym class by walking her. She provided an incentive for one little boy during speech therapy sessions to become more communicative when she was present. While Emmy’s main visits centered around children, she also visited the long term care unit where she brought some joy to the elderly residents who enjoyed petting her, or watching her perform tricks or a freestyle dance routine. many. She is very deserving of this award and it would be very fitting as she was retired earlier this year.